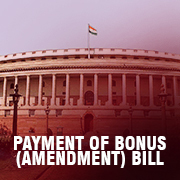 The Payment of Bonus Act has enhanced the limit of salary for availing bonus from Rs. 10,000 to Rs. 21,000.